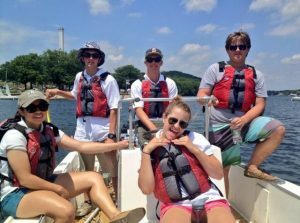 Join the team at Regatta Point Community Sailing! Regatta Point Community Sailing, Inc. is has several openings for the coming season. We are located in Worcester at Quinsigamond State Park, just across the street from UMASS Medical, Lake Chauncy in Westborough and Coes Pond in Worcester. We provide sailing, paddle sports (kayaking, stand up paddle boarding & paddle boating) and sailing instruction for both children and adults from the Greater Worcester area. Youth Programs Director – must be 21 years old and a certified lifeguard (we can help with certification for a qualified candidate). You DO NOT need to be a sailor for this position, however, you will have several sailing instructors working for you. Program Director – Special Programs – must be a competent sailor with the ability to deal with clients, schedule resources, and organize and implement programs for children. Weekend Manager – oversee safe operation of member services and boat rental business. The hiring manager is Lucas Markgren, Operations Manager. Please feel free to reach out to him with any questions. Are you at least ___? Please fill in your available hours on each day in the format 8am-8:30pm. Leave blank if you are unavailable that day. Please fill in your available hours on each day in the format 9a-5p. Leave blank if you are unavailable that day. If you can work in the Spring, how many days per week would you like to work? Please include discussion of sailing ability. Please list starting with most recent. You may list up to 3 former employers. Add more employer info using the + button. Provide the names of three people not related to you who we may contact. You may list up to 3 references. Add the references using the + button. I authorize investigation of all statements contained herein and the references and employers listed above give you any and all information concerning my previous employment and any other pertinent information they may have, personal or otherwise, and release the company from all liability for any damage that may result from utilization of such information. This waiver does not permit the release or use of disability-related medical information in a manner prohibited by the Americans with Disabilities Act (ADA) and other revelance federal and state laws." By checking this box, I am providing my digital signature and acknowledge that I have read the above authorization information; I have verified the content of my application to be true and complete. Please fill out the following for security purposes.